Tiruvalam is around 25 kms from Vellore. 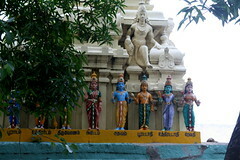 There is a very famous Sivan temple there called as ‘Vilvanatheeswarar Devasthanam’. As the sign board says, it seems this was the place where Lord Ganesha did a pradakshanam for his parents and got the mango. And this was the place where Dakshan was doing a Yaga, which Lord Siva destroyed. 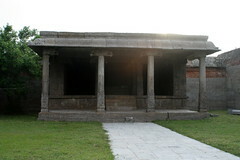 It is a paadal petra sthalam. It is a very huge and beautiful temple, built by the chozhas and later by Pallavas. There are quite a few references of Rajendra Chozhan in the stone inscriptions. There are many unique things in this temple. 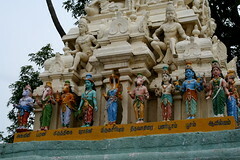 For instance, I have never seen idols for the Tamil Stars(Natchathirams) like Aswini, Barani, Karthigai etc. There are totally 27 stars and you can see an idol for each one of the them. It can be found on the vimaanam of the Moolasthanam. 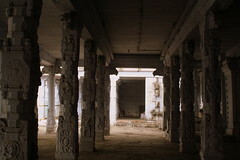 Almost all the pillars are very nicely decorated with some sculptures. One particular sculpture caught my attention. 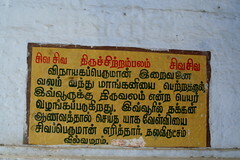 According to history, an Asura Kanjan lived near the temple(At a place called Kanjangiri) and used to torture people. He stopped people from taking water to the temple. Kanjan had taken a boon that he cannot be killed by anyone belonging to Devar, Munivar and Asurar. So the Nandi came to the rescue of people and tamed Kanjan. That is one of the reason, Nandi is not facing the god but towards Kanjangiri. 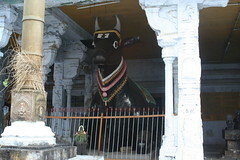 Huge Nandi! 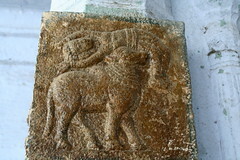 And this story is depicted in the sculpture. This temple is 20 kms from Vellore. From Vellore go towards Katpadi, and take a right turn at Katpadi bus stand and keep proceeding till you meet the Chennai-Bangalore NH4 highway. You will reach Tiruvalam. It is near an old bridge. You can ask anyone and they will direct you to the temple. In case you visit this temple try to spend sometime at the Natarajar Mandapam. 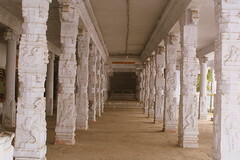 Some 100 pillars are there, and it is extremely quiet. And in the veLi pragaram to the left, you can find a subway. No one knows where it leads to! Melpadi is a small village on the Tiruvalam – Poigai road. There is a Sivan temple close to the shore of the river(River without water). 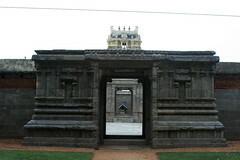 This temple is called as the Somnatheshwarar temple and is maintained by ASI. It seems great grand father of Rajaraja chozhan (I could not get his name. 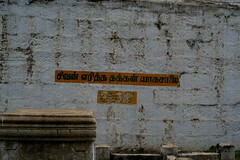 Something that starts with aruNa’) was visiting this place after the war at Thakkolam. He died while he was resting here. So his son built this temple and also a samadhi for his father. This temple is open only till 6 in the evening. Ideal time for visiting this temple would be after 5 PM. Its very nice to see in Twilight. It is secluded, empty and therefore very nice. Apart from me there were only two people. Temple priest and one guy from ASI. Actually you are not supposed to take photographs inside the temple. 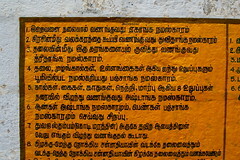 In case you want to do that, take permission from the ASI office within Vellore Fort(Near Jalakanteshwarar temple). It is not very tough to get permission. So in case you are visiting this temple do get the permission. Unfortunately I could not! This temple is around 12 kms from Tiruvalam. 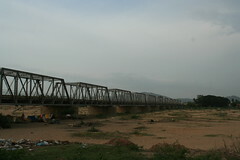 It is on the way to VaLLimalai on the Tiruvalam – Poigai Road. Tiruvalam is in the south. Chennai in East, Bangalore in the west and Melpadi on the north. After crossing some 7 or 8 kms do ask people for Melpadi. It is a very small turning and there are very high chances of you missing it. Not many people know of this temple. So ask for Melpadi(pronounced melpaadi), and once you are in Melpadi ask about the temple. By the way there is another village nearby called as ‘Erukampattu’ and there is a perumaL temple close to the shore(Again river with no water). This temple closes by around 3.30 or 4 PM itself. So visit there first, and then come to Melpa(a)di. Entire set can be viewed here. thank you Ferrari. I might never get a chance to visit these places in this lifetime.. who knows. but your posts are a good way to vicariously enjoy these temples..
Nice one. Nice travelogue and good info. Pics are nice. Nice pictures. Old temples have a charm about them, maybe coz they aren’t really crowded and it gives you ample time and space to soak the atmosphere in. Arrur near Melpadi, Vellore: Rajaraja Chola I erected a Siva temple called Arinjisvara as a tomb-shrine in memory of his grandfather Arinjaya Chola. In addition to what Nithya said, when it is in print in the form of a book, it makes for a great memento to gift, it becomes a great must-have for personal library. For someone like me, who keeps collecting books and maps, such a book would be a blessing. it was not a maangani that was fought for. it was a gnaana pazham! continue the good work – it is a pity that all these ancient temples are still not known to many in Tamilnadu, barring ones living closeby. State abounds in. It needs many Ferraris to highlight these treasures !! I would like to visit the Serapananchery temple first… Wanting to go there for a long time. 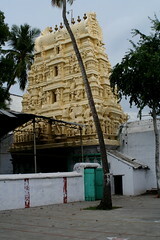 Try visiting this Shiva temple in Thirupasur. 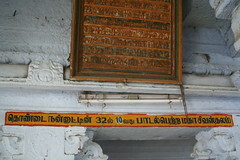 About 4 Kms from Thiruvallur Veeraraghava swamy perumal temple. I would like to give some information on this site. i am going to visit this place tomorrow. i am living in chennai but a native of Gudiyatham. The name of Grandfather of Raja Raja cholan is Aringyaya cholan. And this temple comes under the style of Sepulchral. Even cholas constructed a temple called Panchavanmadeveeswaram near Tiruchirapalli. Regarding Tiruvalam. It is mentioned as work done by cholas and followed by pallavas… But pallavas are predecessors of cholas. Kindly check this information. I think the rest of the info looks good. Really good one. Continue good work… I’ve been thinking of writing about temples of North Arcot Dist as Iam a native of that place… But you’ve done it in a better way.. Thanks Ferrari. Super work. I have passed thru Tiruvalam and will be driving to Chennai from Bangalore shortly and wanted to see if there are any interesting temples there and your work was so very helpful. Keep the good work going. Thanks mate! 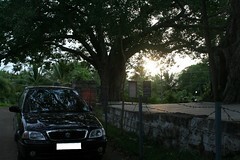 There are lots of ancient temples which are worth visiting while you drive from Bangalore to Chennai. As you know TN is land of beautiful Temples. 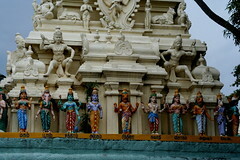 Here are some of the temples wort visiting on the way to Chennai. Iam poiting at only those temples which are built more than 100 years old. 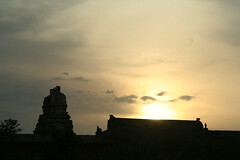 3) Kanchipuram is a land of beautiful Temples.. U need atleast 2 days to cover the temples in Kanchipuram alone. I would strongly suggest u visit kancheepuram and then go to Chennai. Just sharing couple of information which I know. Hats off to you Ferrari ! I too have visited many temples, took many pictures but never got to write anything about them. With a simple description and good pix . . . . That’s something ! I am truly amazed the way you had covered Melpadi. I was 10 years old at that time and my Dad was the Executive Officer in Vallimalai Temple. We resided in this nondescript village and we truly enjoyed our stay playing at these temples on our holidays. I remember on one maattu pongal day there were some bull race on these roads. Your photos are so nostalgic. Keep it up! 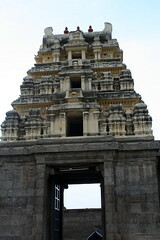 A nice travelogue and good source of information combined with pictures of beautiful temples. This place was so dear to me when I think of my adolescent period spent in Ponnai and moved around these places with my cousins. Thank you very much to give life for my unsung notes.